Celebrations on the occasions of birth anniversary of Desiya Kavi Subramanya Bharathi, the great National poet is on at Thiruvallikkeni. Vanavil Panpattu Maiyam is organizing the poet’s Birthday as Four day celebrations to culminate on 11th Dec 2013- at the very place where he resided in Thiruvallikkeni, Thulasinga Perumal Kovil Street, just opposite Lord Azhagiya Singar sannathi. Today[9th Dec 2013], photograph of a freedom fighter was unveiled by Senior Advocate and Barathi fan – Mr R Gandhi……….. here is something on that great person whose portrait was unveiled at Barathiyar illam @ 07.30 pm. 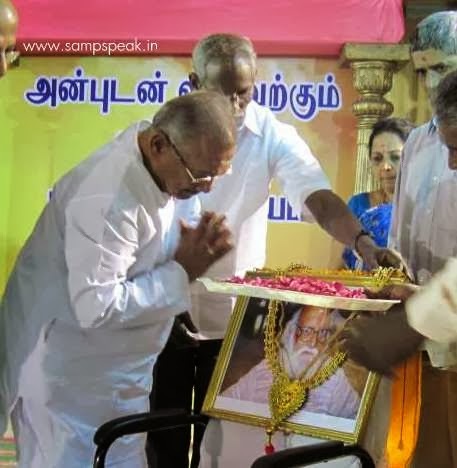 I had posted earlier on Jan 28th 2010 of the pain and efforts of an individual, a freedom fighter ~ PN Srinivasan going through the arduous legal process :http://www.sampspeak.in/2010/01/famed-marina-beach-ala-thilagar-kattam.html. It was his Writ Petition filed in the High Court of Judicature at Madras that finally ended in the direction to the Govt. on installation of this plaque opposite the Presidency College near the historic place known as "Tilak Ghat" or "Thilagar Kattam". 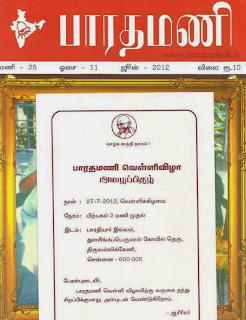 “The historical significance of "Thilak Ghat” was well explained in the affidavit where the Tamil National poet Mahakavi Subramania Bharathi sang three National patriotic song to enthrall the audience of about more than 5000 people. This happened at Tilak Ghat at Triplicane. The silver bed of Marina Beach at Madras was the venue where the great national leaders like Balagangadhara Thilakar, Lala Lajpath Rai, Bipin Chandran Paul, Mahathma Gandhi, Subash Chandrabose, C.R. Doss, Mahakavi Bharathi, V.O. Chidambaram Pillai and others made their clarion call to the people of the land to raise against the British rules. In 1908, Subramania Siva, a core patriotic and friend of Subramania Bharathi have named this part of the Beach in Triplicane opposite to Presidency College as Tilak Ghat. Sri PNS wanted this historic place to be declared a national monument and that monument to be erected at the same place so that the future generation would understand the sacrifices made by the forefathers for the freedom of the Nation; in 1987, a Gazette notification too was issued still nothing happened thereafter. Relentlessly this Gandhian knocked the doors of Court and in 2004 filed a writ. 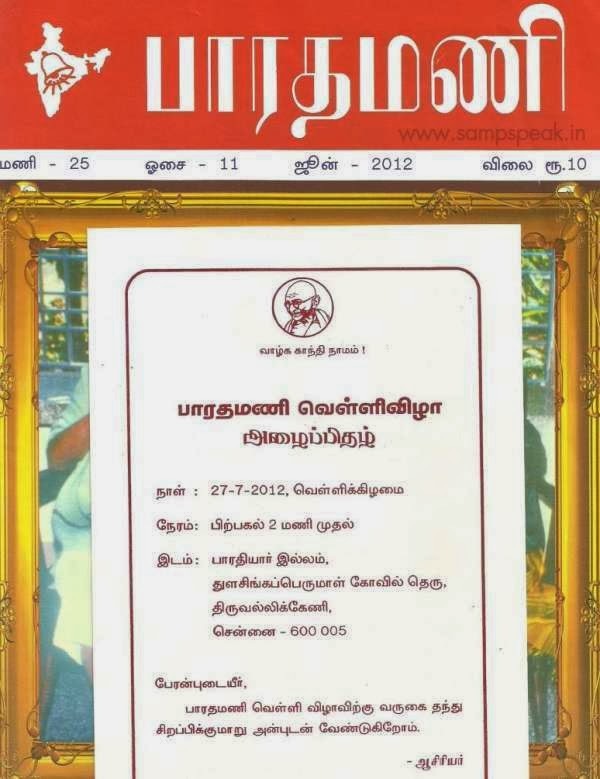 Finally orders were issued declaring the place as "Tilak Ghat" or "Thilagar Kattam", and to commemorate the 26th January 2010, the 60th anniversary of Republic by putting plaque at that place (in English & Tamil)….. the plaque still adorns Marina. 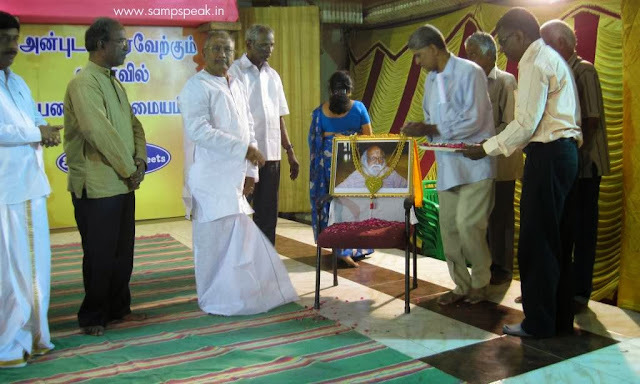 With regards – S. Sampathkumar – in the service of the Nation and elders.